Minister of Education Dr. Matthew Opoku Prempeh has brought together feuding factions fueling the “threatening” development at University of Education, Winneba (UEW) for peace talk. According to the minister, the prevailing situation at the university was a “source of worry” to his ministry and other stakeholders. At least 30 staff have either been dismissed or demoted at the University of Education, Winneba as accusations and counter accusations on the administration of the university culminated into students demonstration. 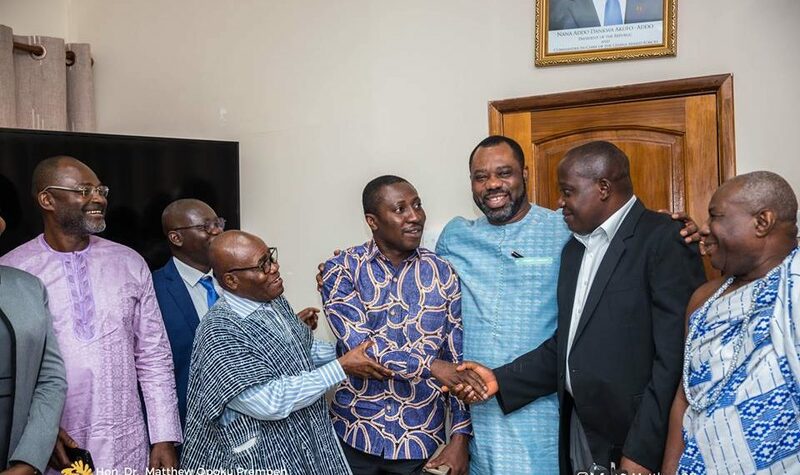 Dr. Matthew Opoku Prempeh in a Facebook post on Friday, March 15, 2019 said he had a meeting with the key persons involved in the issue, and that the parties have agreed to come together in ensuring that peace prevails for teaching and learning to take place smoothly. “I decided to invite the Vice Chancellor of the University, Rev. Prof. Afful-Broni, the Chairman of UEW’s council, Prof. Emmanuel Nicholas Abakah, the Member of Parliament for Winneba, Hon Alexander Afenyo-Markin, and some other staffers of UEW and concerned members of the community for a meeting to address the situation that was threatening the stability of peace at UEW. “Differences were addressed and settled with an agreement to collaborate in addressing issues that affect stakeholders directly and indirectly,” Dr. Opoku Prempeh noted. He expressed confidence that the new found understanding will serve as a bedrock for peaceful deliberations and relations at the UEW. On Monday, March 11, news of the sacking of some seven staff of the university broke. Amongst the sacked persons were two senior lecturers, one of whom was very vocal in speaking against the dismissal of former Vice Chancellor of the university, Professor Mawutor Avoke. The sacking of these seven persons led to some agitations amongst some staff and lecturers of the school. Some students embarked on a protest march calling for their reinstatement, a protest which created chaos following a standoff between the protesting students and police personnel. The situation led to the closure of the school. It is on the back of these developments that the minister called a meeting between management and major stakeholders on the issue.